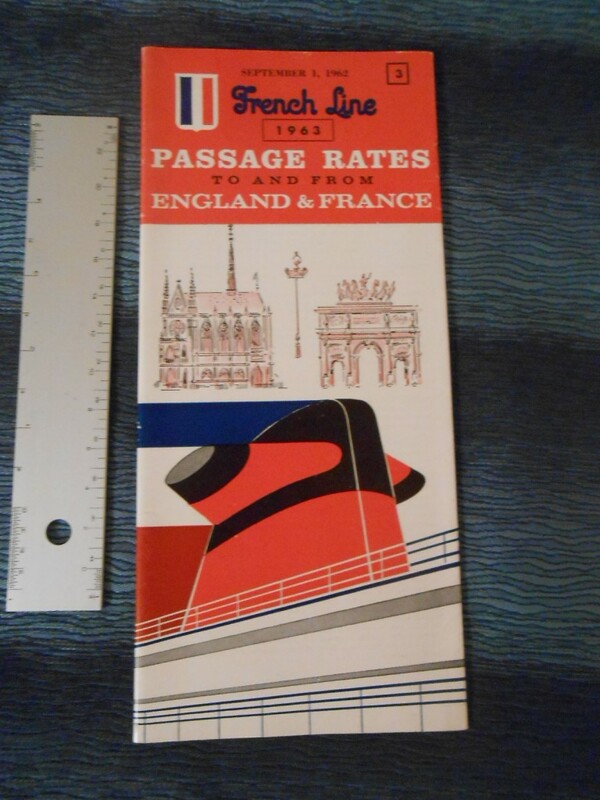 Really nice folding brochure … containing rate and sailing info as well as great color phots of interior spaces. I love the artsy funnel cover. I was born the month is was issues in January 1969. Excellent condition. 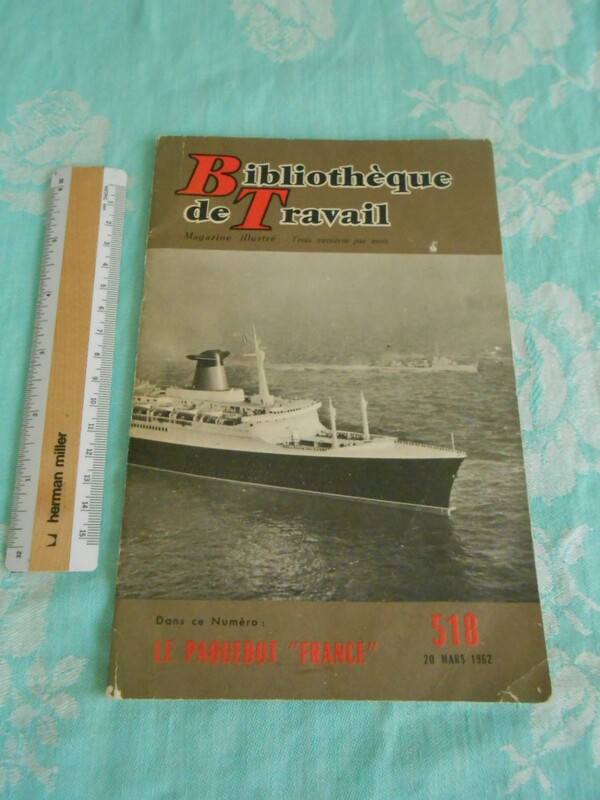 Lovely shape… includes some pictures of interior spaces and general ship info . A little cursive writing on the cover. 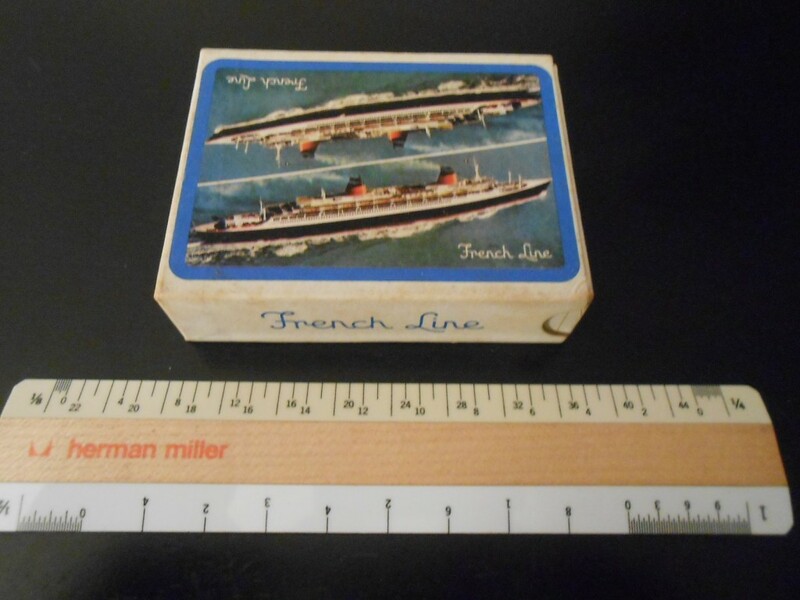 One of the most popular souvenirs of the 1950’s … I have these in either green or pink .. no idea if there were other colors. Nice condition. 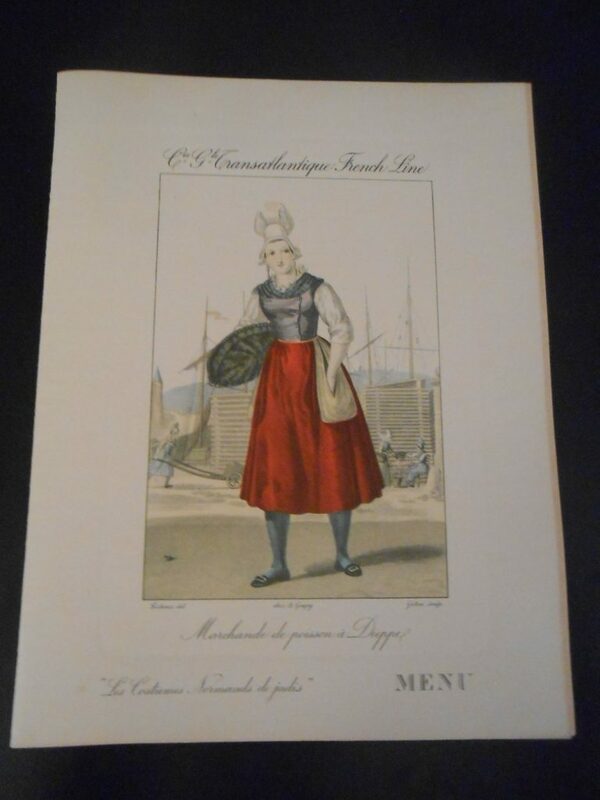 Lunch menu dated Dec 27th 1936 .. written in French and English. These folks ate like Kings! Great shape with a little yellowing. 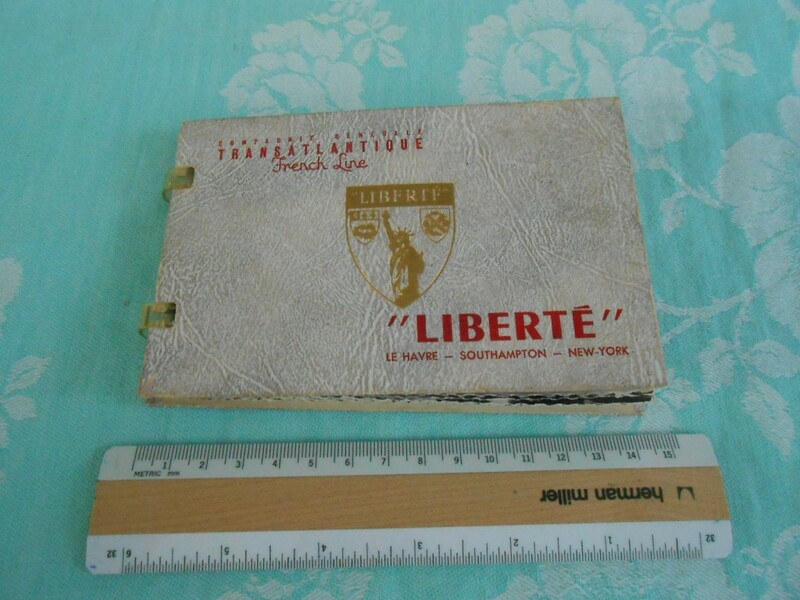 Nice postcard booklet for the Liberte. There are 18 interior postcards and one port profile. The cover has the ships shield embossed in gold and sports red lettering. There is some general scuffing but in good shape. Lovely interior views on each of the deckled cards .. you will love this! Probably purchased onboard. 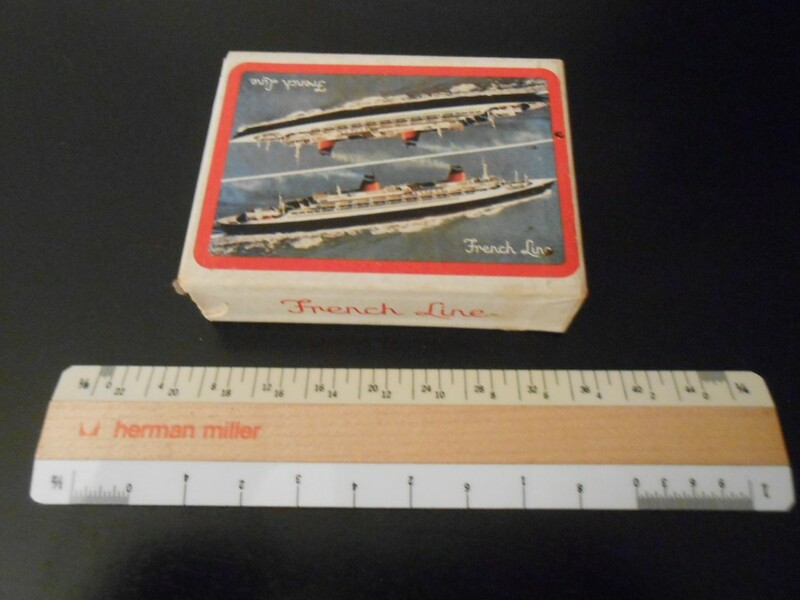 United States Lines: SS United States Holiday Cruise Daily program. 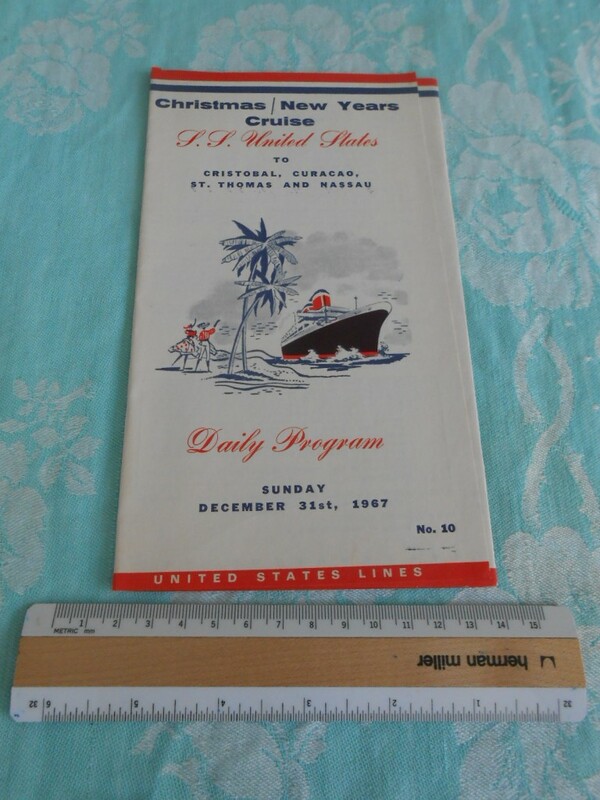 Neat SSUS daily program dated 12/31/67 for the Christmas/ New Years cruise to Nassau and other warm weather ports. The program starts with the pool being available at 7AM and ends with the various New years Eve parties onboard. Great shape … though folded a little funny. 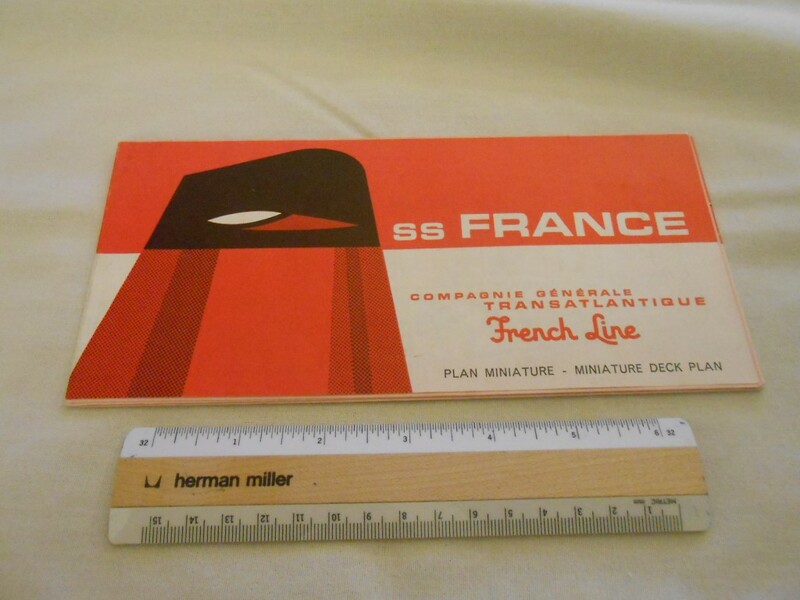 Great little French language booklet dedicated to the building and outfitting of the SS France. 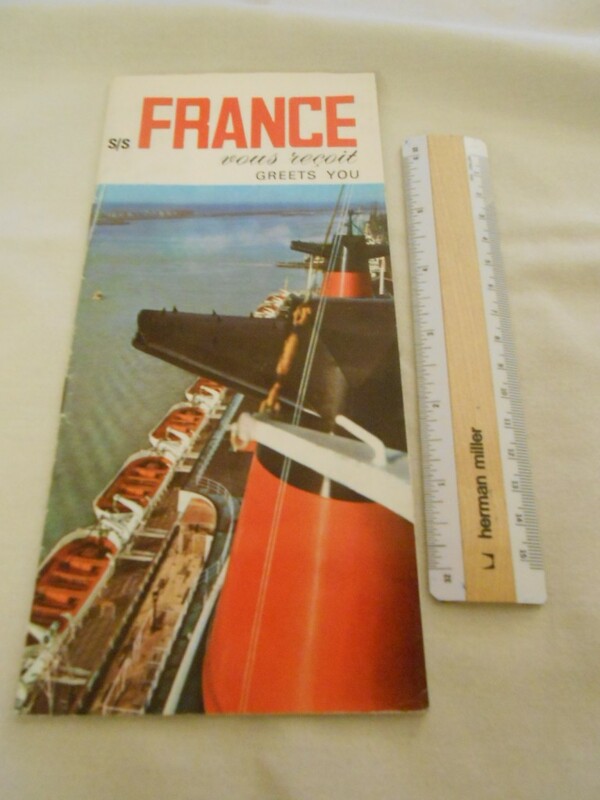 Filled with lots of photos and diagrams of the ship from keel laying to her Maiden Voyage. 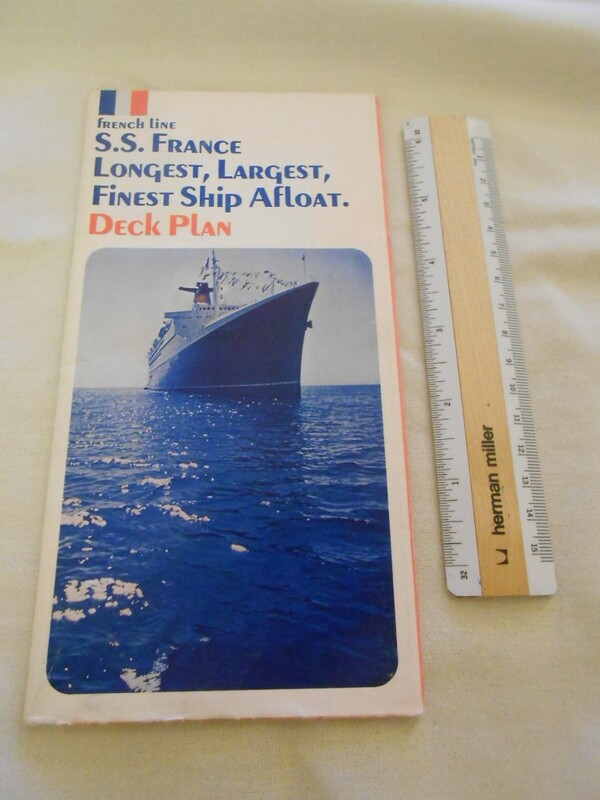 In great shape, 26 pages and includes a little insert about the ship. Dated 20 march 1962 a little bend to the front cover. 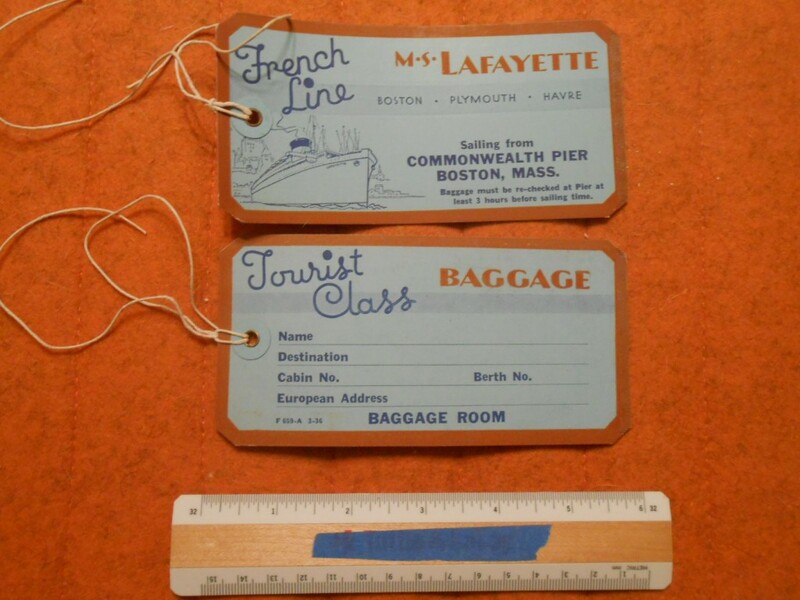 Excellent Baggage tag for the MS Lafayette. She had a very short life … less than a decade from launch to her destruction by fire. 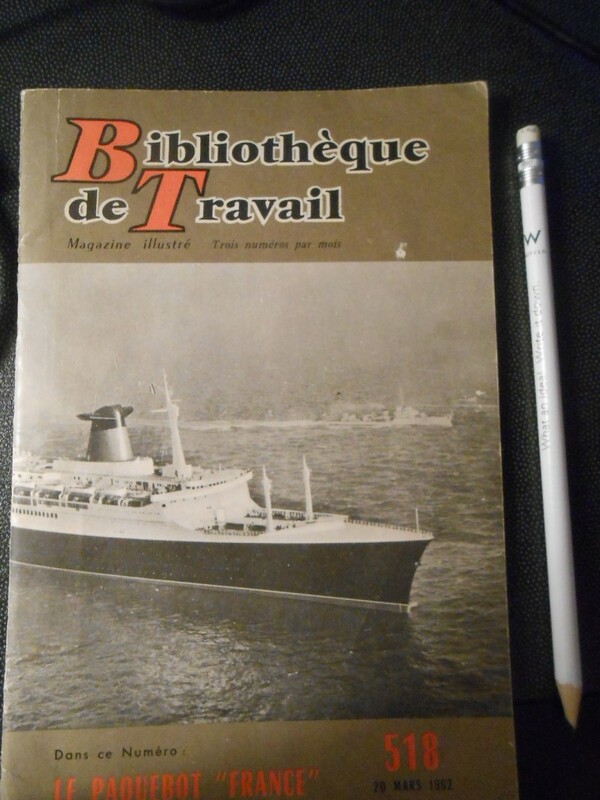 She had majestic deco interiors and was an evolution forward in the French Shipbuilding program of the 1930’s. The Tag is in like new shape. 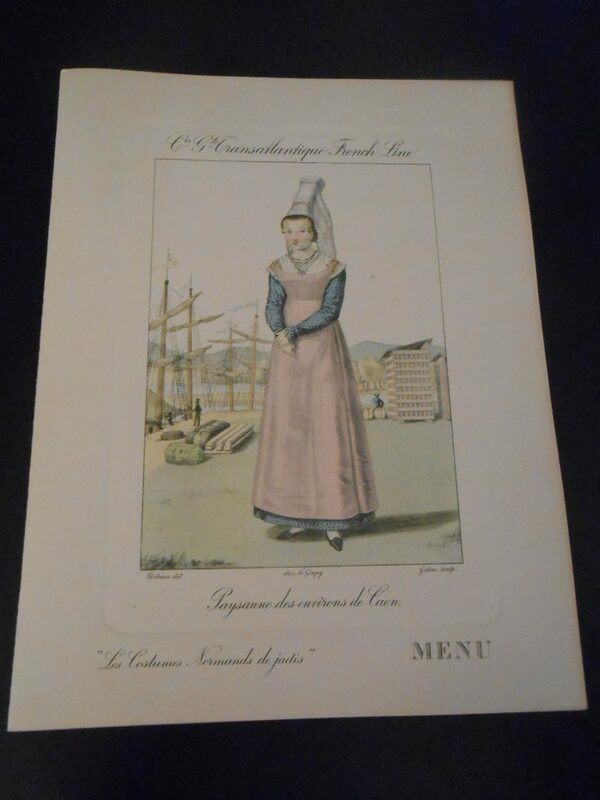 The picture shows Front and back … cute little ship profile! 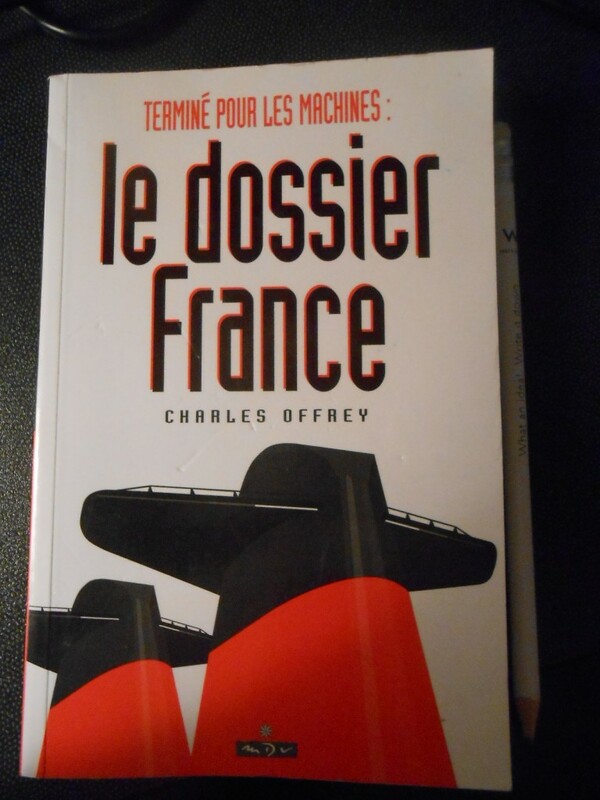 Great book by Charles Offery describing the details of the SS France’s machinery. Over 250 pages of information … all in French. Offery has penned other French Line texts. Unfortunately no pictures … just cram packed with info. 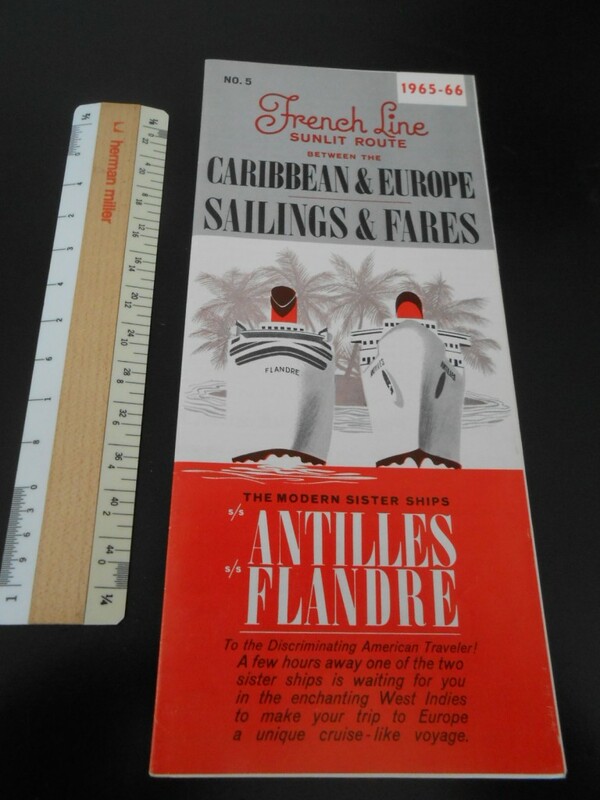 Excellent miniature deckplan for the mighty French lady. In excellent shape … has both the deckplans and some BW photos. 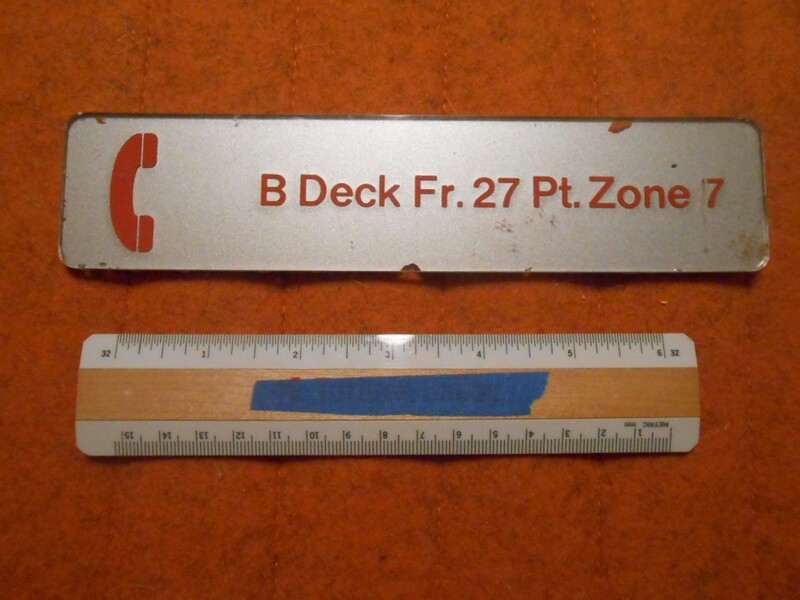 Nice bi-lingual first class deck plan for the lovely ship. There is a little bit of wrinkle to the pages as shown … but it does not appear to be water damage. Great colored coded plans and pictures inside. Approx 1966. 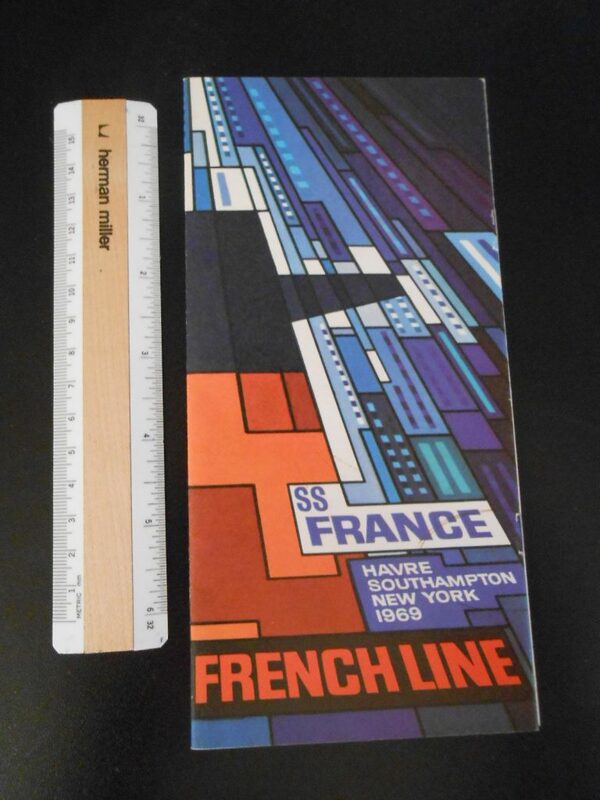 Awesome booklet brochure showing the interiors of the French flagship in color photos as well as French and English descriptions. There is a lovely centerfold gulls eye view of the liner streaming through the seas. the last page is a nice general profile cut away of the ship. 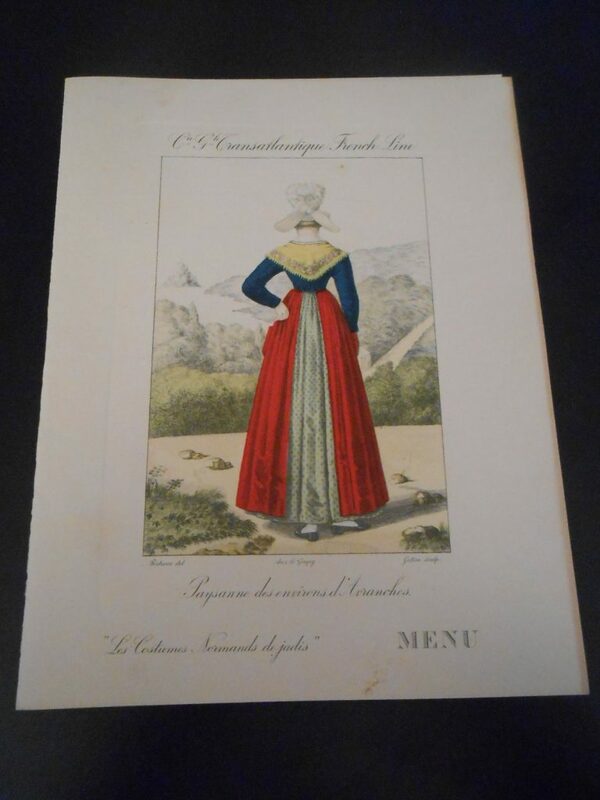 Lovely heavy glossy paper plan … in great shape. Dated Nov 1972 and agency stamped Budd Travel Newton , NJ. 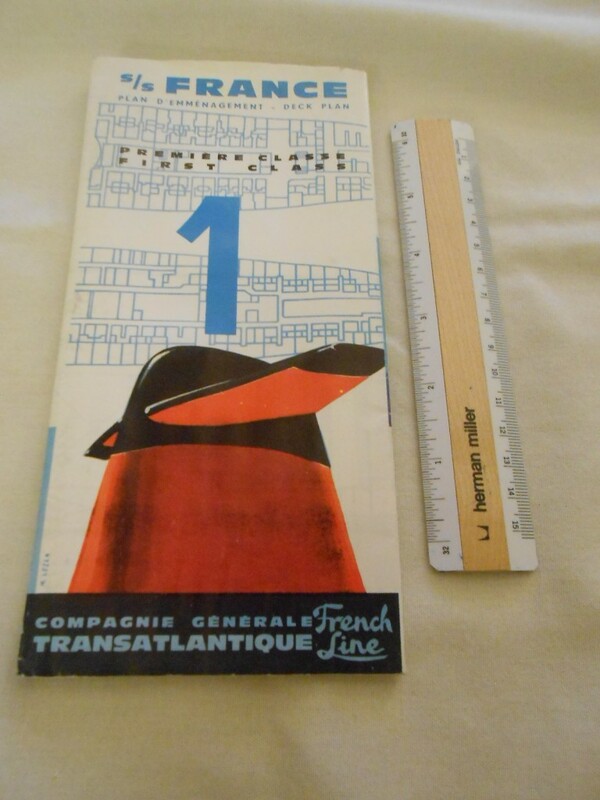 Awesome almost full pad of French Line paper … the cover is a clever graphic of a modern funnel in the bright red and black colors. The inside is ready for all of your liner notes and scribbles. Excellent condition! 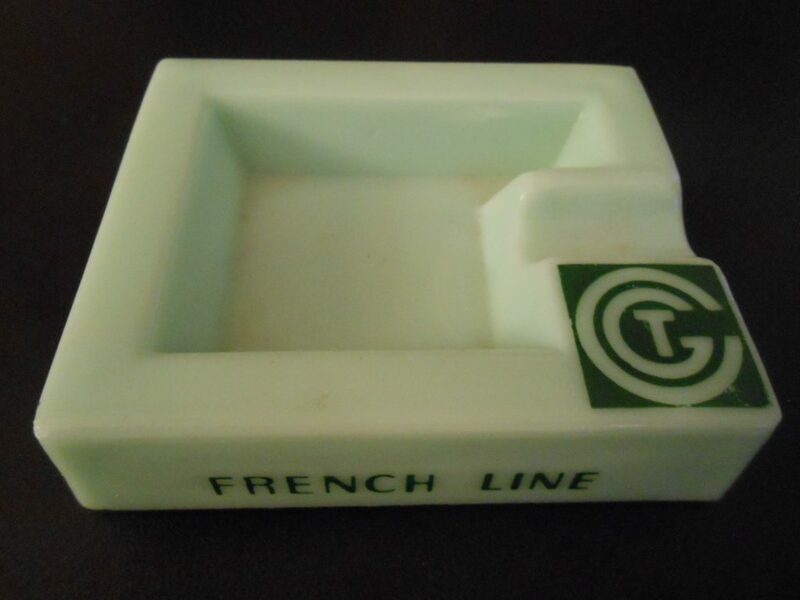 Interesting portrait ashtray for the Magnificent French Liner. 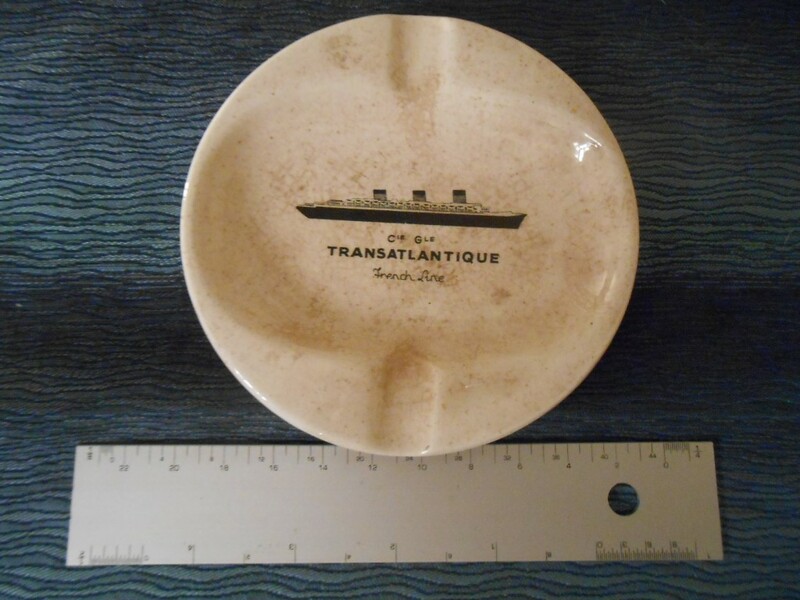 The glaze shows browning and crazing … but the image of the ship is still excellent. I think it looks rather shabby chic. Good condition no cracks or chips etc. 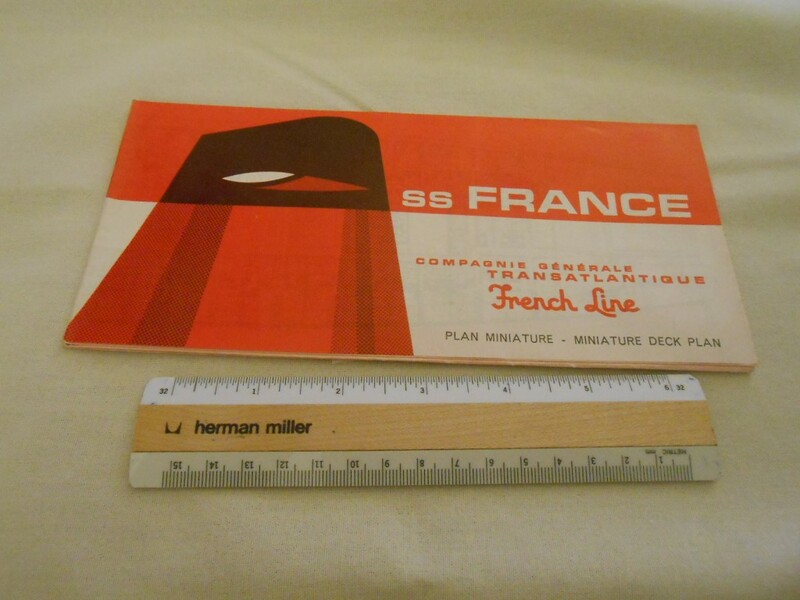 Lovely deck of blue trimmed cards for the SS France. Probably bought onboard. All there and in great condition. 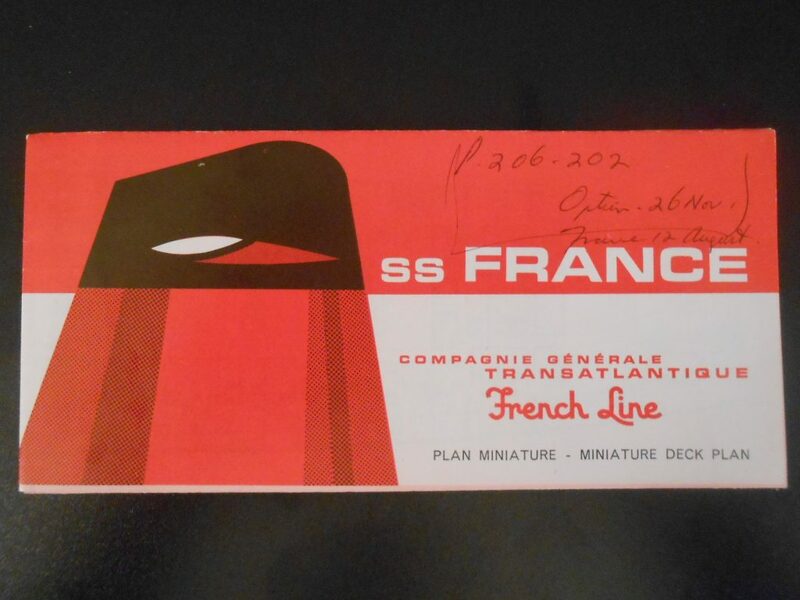 Lovely deck of red trimmed cards for the SS France. Probably bought onboard. All there and in great condition. Great little booklet welcoming folks on board and explaining nautical terms and on board info. Very extensive coverage of what to expect on the voyage … including deck, room and activity information etc etc. 36 or so pages. 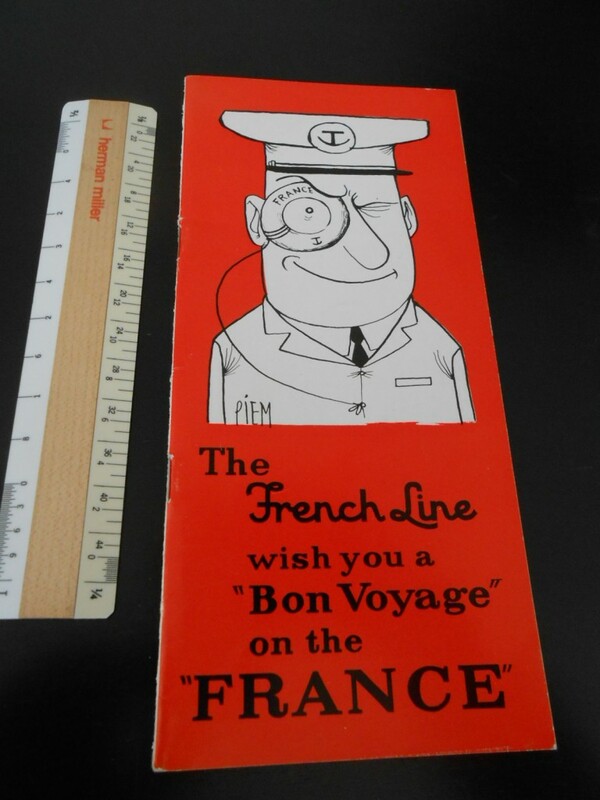 Excellent shape .. a little glue residue to the back cover … must have been a scrapbook memento at one point. 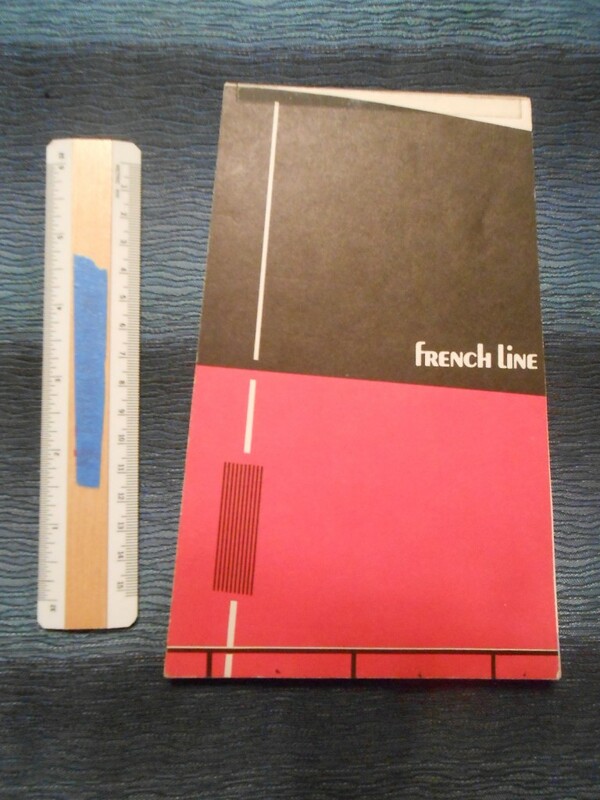 Great little folder for the French Sisters. Lovely profile and some interior pictures. The were paired in the certain times of the year for West Indies services and cruises. Great condition …like new with a little sticker blemish on the rear panel.